Both. We tell them to do both. Do we need to focus on gun violence or do we need to focus on bullying to help end the violence in our schools? I say both. Both are valid issues, but one is more deadly than the other. Bullying is more deadly. How about if we not only Walk Out to address gun violence, but also WALK UP and be kind- to tackle bullying? That is a great place to start and be able to make an immediate change where they live. Why did I write to them? 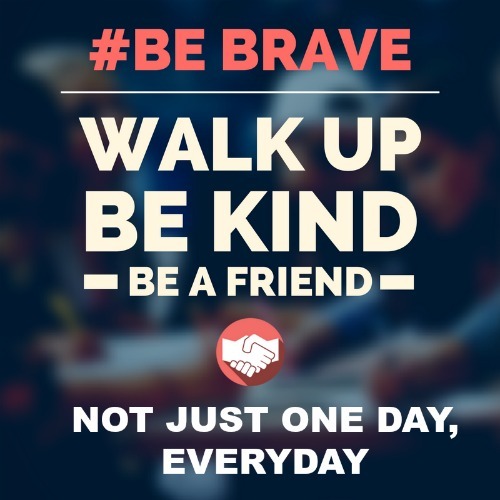 Because CHANGE must happen in this country- real change- that has to come from the top down where we ALL decided to #BeBrave and stand up to bullying. She saw a big problem happening in our country that affected young people, and tried hard to fix it. She was a voice alone trying to raise awareness to a terrible problem that was affecting tens of thousands of teens, and killing thousands of them. Here’s the thing: in all the notes she mailed out, she didn’t receive ONE SINGLE RESPONSE. NOT ONE PERSON THAT SHE REACHED OUT TO IN GOVERNMENT RESPONDED TO HER PLEA FOR HELP. On March 14th, thousands of young people will be walking out of school. In a protest organized by a political group, Empower, an offshot of the Woman’s March. According to CNN. “The nationwide protest is both a memorial and protest action. Students and teachers across the United States will walk out of their schools and universities to honor the lives of the 17 people killed at Stoneman Douglas and press lawmakers to pass stricter gun control laws, according to EMPOWER, the group organizing the action. Pass a gun violence restraining order law that would allow courts to disarm people who display warning signs of violent behavior. I’m going to be honest. I struggled with this walk out. I am supporter of the 1stamendment, but I am also a strong supporter of the 2nd amendment. I don’t want to see our rights to own guns taken away. I believe that our forefathers were brilliant in their writing of our Constitution and Bill of Rights, and I believe that the right to bear arms is a very important right. But I also believe in MOST of what these young ones are saying. Universal background checks,and the gun violence restraining order both make a lot of sense. Its not taking away the right to own guns, but taking the time to be sure they are owned safely. It is nearly impossible, or at least very difficult for someone to own a fully automatic gun now, and what I struggle with is the call to ban semi-automatic weapons. I, personally, think that the purchase of ANY weapon should have a waiting period, and have comprehensive background checks to buy one. The truth is there are over 15 Million AR-15 that are owned in the United States, and while they have become the gun of choice for mass murderers, they are responsible for 154 deaths in school shootings. But lets take a look at bullying, and school shootings. Suicide is the third leading cause of death among young people, resulting in about 4,400 deaths per year, according to the CDC. Bully victims are between 2 to 9 times more likely to consider suicide than non-victims, according to studies by Yale University. So, yes, gun violence in schools needs to be addressed, but we need to address the REASONS behind gun violence, and a big part of that is bullying. Bullying needs to be addressed as well. I’m not talking about lame “zero tolerance” policies that are not enforced, but real policies. If we are honest with ourselves, we have to take a look at our kids, and how they treat others. We have to look at our parenting and what we teach our kids about right and wrong and how to be kind. We have a lot of work to do, and its not all about guns. We home school now, after our daughters suicide attempt due to bullying, but our local high school kids made a video that was very well done. I am not sure if they are honoring the 17, or just using their deaths as an impetus for change, but They are working for change. I am proud of them for that. hope that its for more change than just guns. There are a lot of ways to kill someone, and a gun is just one. Bullying is another way to kill someone, it’s just slower. Help me make… the United States takes bullying seriously. I am trying hard to be the change I want to see in the world. Will you help me? Not one politician answered, but I wonder how many will be standing by kids walking out for gun control. Let’s stop making our kids political pawns and make them safe, both physically and mentally.